How does one evaluate a year? By the art it produced? By the major news events that dominated headlines? By the Dow Jones average? Atlas Obscura has a different idea altogether: by the truck spills. Yes, the site has taken the time to assemble an interactive map of the United States showing all the places where trucks spilled things on the nation’s highways and byways. From Juneau, Alaska, to Coburn Gore, Maine, and down to Miami, Florida, America’s truckers accidentally dumped all kinds of interesting substances on the streets this year. In October, for instance, a big rig flipped over and spilled 20 tons of cheese on Interstate 5 while barreling through Ashland, Oregon. This January, a driver down in Brazoria, Texas, somehow managed to spill an unknown quantity of chicken steroids on Farm To Market Road 2917. Each of these incidents is given its own color-coded icon on the map. Clicking on one will bring up a little info box about the accident in question, detailing what exactly was spilled when and where. It also tells whether there were any serious injuries as a result. 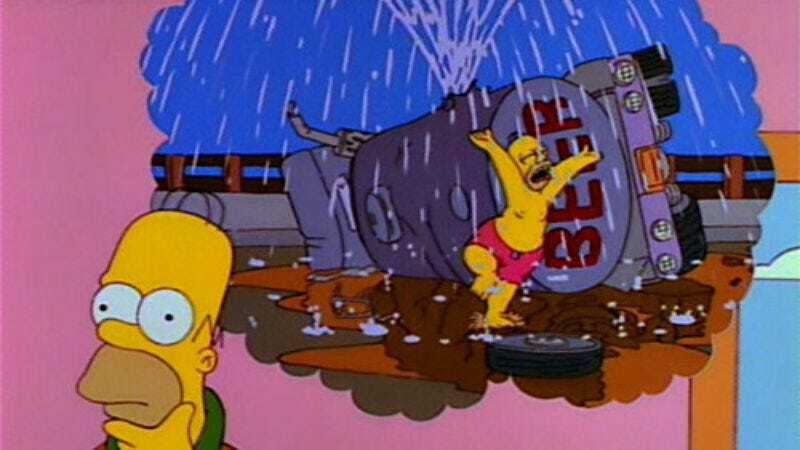 For the Homer Simpsons of the world, hoping to find overturned sugar or beer trucks, the red icons denote spillage of foods and beverages. In fact, there was an accident involving a beer truck on the Interstate 70 overpass in Denver back in July. But, as Atlas Obscura explains, “The 60,000 pounds of Miller Genuine Draft was expired and was on its way to be recycled.” There weren’t any incidents of raw sugar being spilled onto the highways either, but there was some ice cream in Whitewater, California, and soda in Las Cruces, New Mexico. Meanwhile, the people of Henrico County, Virginia, had an incredibly literal opportunity to ponder that old saying “Don’t cry over spilled milk.” About 46,000 pounds of the stuff leaked from an overturned tanker truck onto Interstate 265 back in April.